After a three week hiatus due to unavoidable personal commitments, I woke up to a couple of news relating to our business. First is this news item in the Times of India on 23rd October, 2017. News item states that unclaimed shares are being misused by a few unscrupulous operators in connivance with Registrars and Transfer agents and perhaps banks. This unholy nexus is quite disturbing. Unclaimed shares invested by parents can make lot of difference to quite a few families. Just a month before we made this blog post “Hook, Line and Sinker?” that underscores a few difficulties and funny things that our business – restoring forgotten wealth, especially unclaimed shares – encounters. We have a huge unclaimed dividend corpus. Total unclaimed dividends in Indian public listed companies is a staggering Rs.9100 crores. If these dividends remain unpaid for over seven years they get transferred to Investors Education and Protection Fund (IEPF). There is a new guideline which mandates unclaimed shares to be transferred to IEPF. Guidelines are being framed. Unclaimed shares over seven years will soon be transferred to Government of India. Total of such shares outstanding can only be estimated. If you apply dividend yield of NIFTY 500 to annual unclaimed dividend, you will get a value in excess of Rs.1,00,000 Crores. This figure is quite credible. Just four companies – Reliance, L&T, Asian Paints and ITC – together have unclaimed shares in excess of Rs.10,000 Crores. Before dwelling deep into the dynamics of unclaimed shares, let’s have a quick look at the scam that’s unearthed by SEBI. Let me leave here and reproduce the summary given in the Times of India. Traditionally, shares were issued in paper forms. Oldest stock exchange in Asia, Bombay Stock Exchange (established in 1875) was employing “Outcry” method for trading. That is, traders shouted the price of stocks in a hall to close the deals. Enactment of Depositories Act in August, 1996 and paperless trading started soon thereafter by National Stock Exchange, changed the topography for good. There was a period of concurrent trading in both paper and demat form and from 1999 Demat Account is compulsory for trading. However, owning shares in paper form is perfectly legal. So, the older IPOs in the 20th century issued paper shares. There were scores of public issues by companies from 1975 to 1995. Some of them turned up astronomical returns. For example, issue price of one share of ITC was Rs.15 in 1976. Today, its value is over Rs.92000/- after accounting for all bonuses and splits. That’s close to 6200x return in 40 years. Little wonder, then, when these shares turn up unclaimed, it is a fertile ground for scamsters. Shares invested have remained unclaimed for various reasons. For starters, youngest of the older generation investors in 70s and eighties are octogenarians or older. Quite a few of them are dead and gone. Longevity was also low in 80s and 90s. Joint holders were allowed. But there is no nomination facility for paper shares. Apart from this, there are scores of other reasons why paper shares fall out of horizon and become unclaimed shares. Some of the reasons are as follows. Change of house and address. Rented house to own house, change in place of work, migrating to other countries etc. Once the dividend does not reach the owner, it becomes unclaimed dividend. By law, unclaimed dividends have to be notified by the companies. Some companies provide the list of unclaimed shares and dividends in pdf or excel format. Some companies allow the shareholders to search them by providing search boxes. One needs to feed the Folio number to get the results. Scamsters are armed with this data. This data is available in all grandeur to the Registrar and Share Transfer Agent (RTA) of the concerned company, replete with last available address and specimen signature. If the reports are to be believed, following is the modus operandi. opened a demat account and bank account using these fake ids. Filed a share missing report with the police station of appropriate jurisdiction and got the acknowledgement. Applied for duplicate certificate with forged signature of the dead man already available with Registrars and Transfer Agents. Since R&T Agents are already in connivance, duplicate shares get issued rather quickly. Immediately it will be sent for dematting. As soon as the shares are demated, they get sold and cash is withdrawn. God bless ATM Cards. In our line of business, we deal with registrars and transfer agents day in and day out. Generally, they are nice people. If you follow the guidelines properly, things get done in the normal course. They have a turnaround time to follow. Generally, they are good people. Black sheep, however, cannot be ruled out. When there is so much of unregulated wealth out there with justifiably very complex procedures, human temptation takes over. This is not a simple case of extending one on one favours in deserving cases and expecting quid pro quo. Look at the array of people involved. Employees of Registrars for documentation and specimen signatures, police for FIR formalities without proper enquiry, bank manager who opens bank account, depository participant for opening demat account, Government agencies that issue PAN cards and voter IDs, professionals who help with documentation all through. If I didn’t go through the report, I would not have believed, this is going on. Handful of rogues making Aadhar mandatory everywhere has justification, after all. In our line of business, we come across many deserving cases who are simply unable to enchase their entitlement due to complex procedures (Don’t get us wrong. Procedures are just fine) while there is organised loot on the other side. Disgusting. Hope SEBI gets to the bottom of this. This is the second news we woke up to. This is not well publicized and was known to mainly industry insiders. 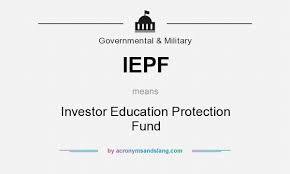 Investors Education and Protection Fund (IEPF) was formed under the Companies Act and its procedural aspects are governed by IEPF rates. Hither to all dividends lying unclaimed with the company for more than seven years were transferred to IEPF fund. Vide it’s notification dated 13th October, 2017, IEPF has amended “The Investor Education and Protection Fund Authority (Accounting, Audit, Transfer and Refund) Second Amendment Rules, 2017 (“Second Amendment Rules”). It has become effective the same day. Without getting into the nitty-gritty, let’s see the highlights of the new regulation. From the date of transfer of dividend, it is required to be encashed within 30 days. Seven days from the day there after, it is required to be declared as unclaimed dividend. Seven years from the date it is declared as unclaimed dividend is the date on which dividend has to be transferred to IEPF account. Same rule is applicable to shares. So, for all practical purposes if dividends have not been claimed from 23rd September 2010, those shares are liable to be transferred to IEPF Account. Original provision treated the migration of unclaimed shares as transfer. As per the new amendment it is deemed to be transmission. Since the original owners have not claimed the shares and possibly are in possession of shares, new share certificates will have to be issued by the companies with the marking “Issued in lieu of share certificate No….. for purpose of transfer to IEPF”. These shares will be dematerialised and will be deemed to be transmission. Stamping and franking is dispensed with. This reduces cost and manual stamping by companies. Call it ease of doing business. Unclaimed shares for the past seven years will now be with the Government in DEMAT form. Scam as stated above may not be easy. It remains to be seen, however, how easy it is to get it back from the company. Since new shares are issued and dematerialised, we think, cumbersome formalities associated with getting the duplicate paper shares may be dispensed with. We need to wait. Transfer to IEPF is deemed to be transmission. Will transferring back to the legal owner will also be treated as transmission? This is not clear. What about tax implication? Will it be treated as fresh acquisition? What about short term capital gain? Do they require amendments to income tax act? Requires more clarification here. Would it lead to quid pro quo on case to case basis as is being alleged when dealing with Government Agencies? How inconvenienced the investor or his legal heir would become? Paper shares will still be with the shareholder or legal heir. If the holder sells it, what is the ratification mechanism? Would it lead to new scam by ever enterprising Indian rogues? Transfer to IEPF has been in the air for a year now and this has become a reality. If there are proper safeguards to the above questions and if there is ease of operation for conversion, this can actually be good for the holders of unclaimed shares. But, considering our experience in dealing with Governments, this is a big IF.